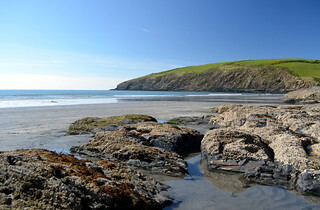 I walked across the vast sandy beach at Newport Sands, in Pembrokeshire (which was rather different to the other Newport), and then peered into rock pools at sea anemones, wandered amongst petrified forests, and then stood inside a magical leafy cave with ferns growing over it. That afternoon, I took off my shoes and socks, rolled up my trousers, and paddled in the Irish Sea, watching the patterns swirl around my ankles. It's a lovely bit of the coast. :) I am very much enjoying my holiday.